About this objectOne-time assistant of Whistler, Sickert’s technique owes much to his association with Degas, whose influence is apparent in the sombre colour palette and sketched brush-work. Painted in gouache on a prepared ground, the mount is made of kid, the monture of smoked mother-of-pearl. The painting depicts Little Dot Hetherington on stage at the old Bedford Theatre, singing ‘The Boy I Love is up in the Gallery’. The image is taken from a series of works of the same subject although it has been adapted to fit the shape of a fan. 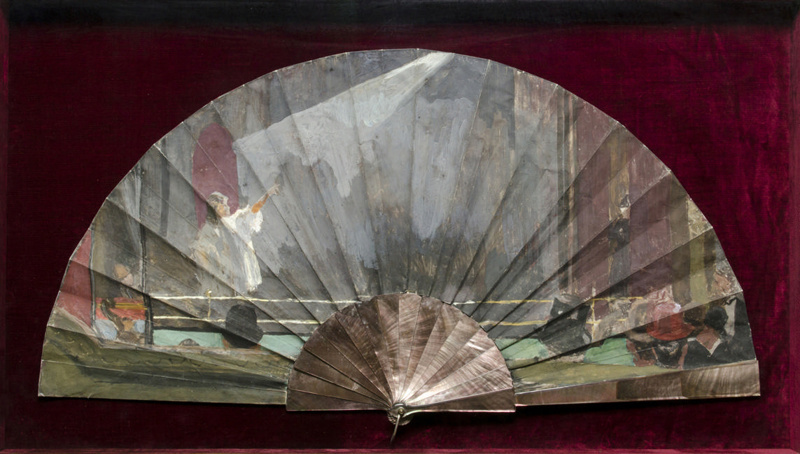 This fan was presented to Florence Pash, a friend of Sickert, and remained in her family’s possession until it was purchased by The Fan Museum. Purchase supported by the National Lottery through the Heritage Lottery Fund and an anonymous donation.